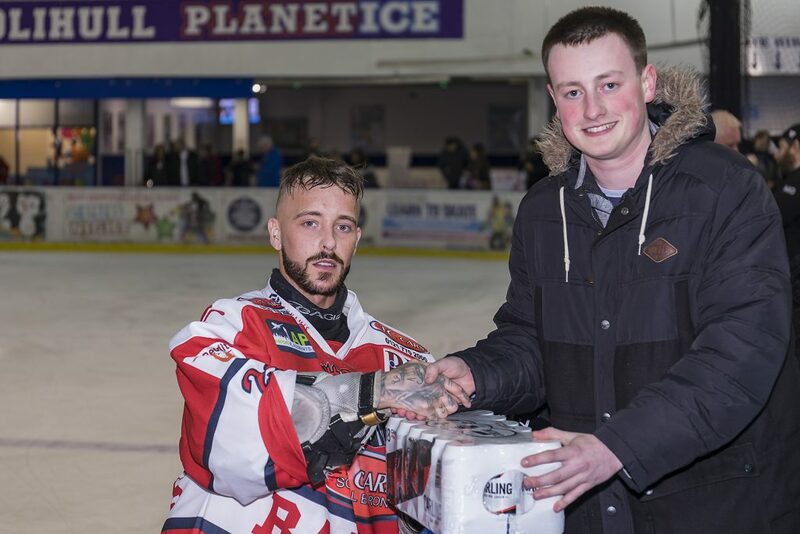 Sunday evening at Hobs Moat was the place to be for high quality National League ice hockey as the TC Cars Barons, despite a month away from competition, emerged victorious in an exciting high energy and competitive game against the Solway Sharks. Into the first period and following a third minute penalty on the Sharks, the Barons were quick to exploit the resulting power play and get an early marker on the board. As Solihull pressed the Sharks goalmouth, Luke Brittle’s shot rung off the metalwork only to fall to an awaiting Elliot Perin on the left hand circle who slotted home from 3 metres. By seven minutes the Sharks had equalised with a powerplay goal of their own, the ever reliable Steven Moore waiting for the traffic to clear, picking his moment before firing in Solway’s opener. 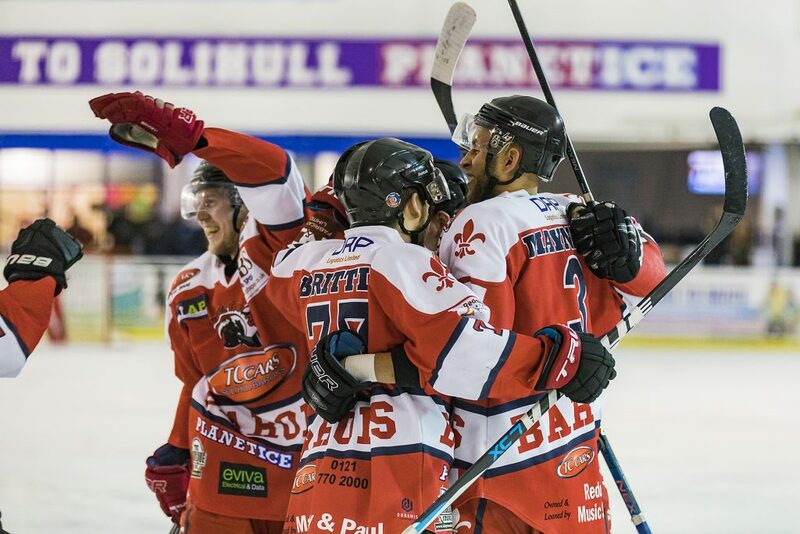 Solihull once more took the lead as a mid period breakway saw Adam Brittle racing up centre ice, with an option of Niklas Ottosson on the left wing dividing Shark’s netminder Jordan McLaughlin attention, Brittle fired the puck netward for the Barons second of the evening. The remainder of the period would see both sides push hard but with no further scoring, the Sharks coming closest with a shot clattering off the Barons pipework on the 15 minute mark. 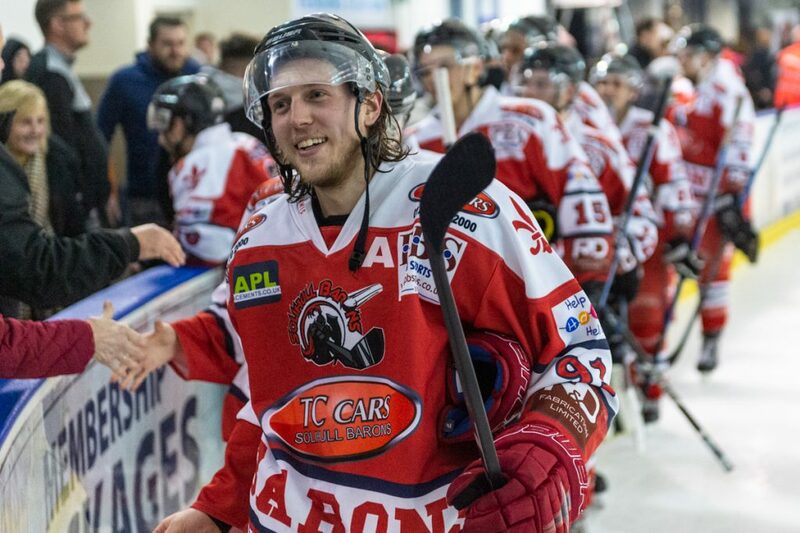 With the Solway pushing hard for an equaliser, most of the first half of the middle period centred on the Barons end and while Josh Nicholls and the Barons defence held firm, they struggled to get much play beyond their own blue line. Any lapse would be quickly punished. 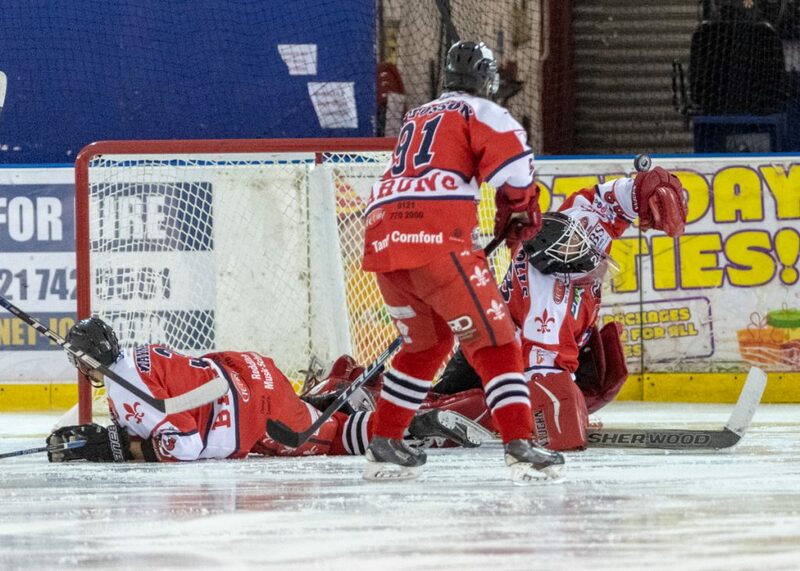 So it would prove as a Barons penalty gave the powerplay to the Sharks on the half hour mark and this was duly turned into a goal with Stuart Kerr firing in a belter from the right of the post. Within a couple of minutes Solihull had their own powerplay and they too made full use of the extra man to leave an unmarked Richard Crowe to plug the net for Solihull goal number three. The remainder of the period would see more open play than the first half with both sides having opportunities but no further scoring. The final period would continue to deliver high quality entertainment, Niklas Ottosson extending the Solihull lead a minute from the puck drop, drawing the puck over the crease before back-handing it in for Solihull’s fourth. Four minutes later and Andy Whitehouse was fed by Elliott Farrell to give the Barons an apparently comfortable 5-2 lead. With little left but to push for what they could get the Sharks pushed hard and encamped themselves in the Barons end for much of the back end of the final period and were rewarded with a goal by Peter Gapa. 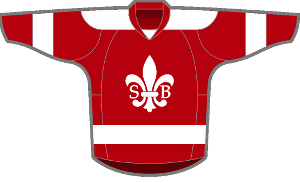 As Solihull began to run into penalty trouble a powerplay goal by Joe Coulter brought the Sharks within a goal of the Barons heading into the final five minutes. 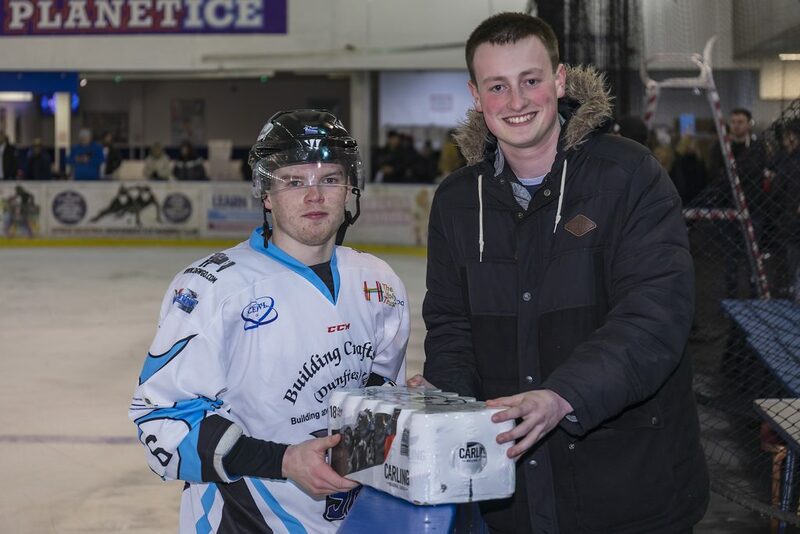 With the Sharks pulling their netminder for the extra forward, the Scottish side pressured Josh Nicholls net and thought for an instant they had forced the equaliser only for the goal to be waved off for players in the goal crease. This was to be the last hurrah for Solway and the Barons emerged victorious from a closely fought and extremely entertaining tie. 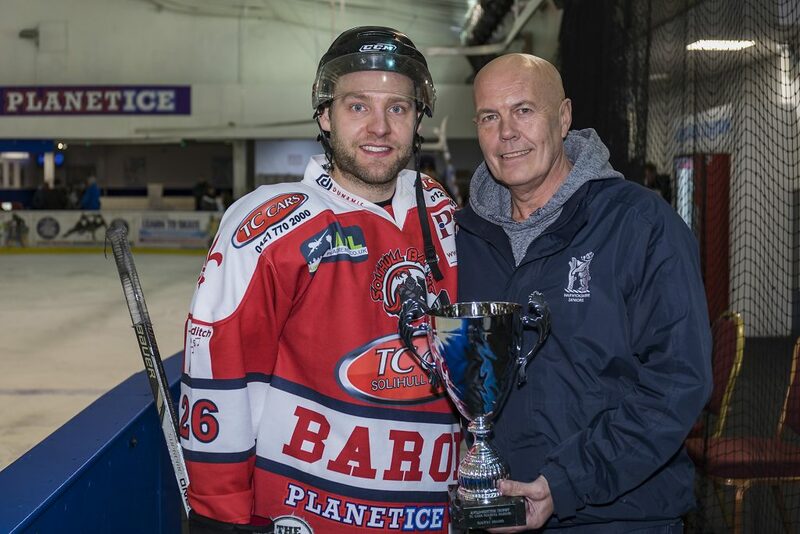 The Barons league season concludes next weekend with an away tie at Telford on the Sunday. 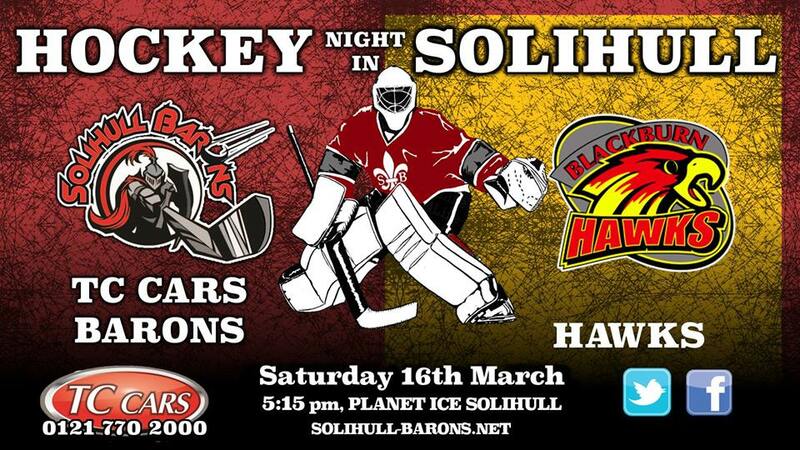 Ahead of that Solihull welcome the Blackburn Hawks to Hobs Moat on the Saturday evening. With the two sides sitting 6th and 7th in the league there will be pride and play-off ranking to play for in what should be another evenly matched tie. Face-off 5:15pm.